SkB Architects has developed an inviting and sophisticated design for the Boston Consulting Group offices located in Seattle, Washington. Positioned at the top of the 1201 Third tower in downtown Seattle, and occupying the 54th and 55th floors, Boston Consulting Group’s new offices represent a substantial shift from their former offices. Previously quartered in a smaller, less bespoke office setting, BCG sought a more inviting and sophisticated environment in which to work. The design challenge for this 24,223-square-foot project was to create an environment that accommodates the Boston Consulting Group’s flexible approach to work space without sacrificing the incredible 300-plus-degree vistas the space has to offer. The design is based on spatial compression and release, the blurring of typical work-style boundaries, and the palpable experience of space. Spatial contrasts begin upon entering the elevator lobby and adjacent reception area. Here, the space is cozy. A curved, tucked-fabric-wrapped wall panel provides a soft backing for the reception area banquette seating, while an illuminated, coved wall curves gently into the relatively low-height ceiling plane. From the reception, the custom-designed, eighteen-foot-long reception desk, reaches out toward the adjoining office and work lounge space where the volume explodes to reveal dramatic vistas of the surrounding city and Elliott Bay. The double-height volume accommodates a wide variety of traditional and non-traditional work spaces including an open work lounge, a multi-use café-style break room, and abundant meeting and focused-work spaces. Employees, mostly consultants who spend 90% of their time at client offices, are free to use almost any space in the office; a few desks are assigned for those needing privacy, including accounting, human resources, and assistants. In response to the off-site nature of its employees’ work, the space is designed with only one workstation for every two employees. The spacious work lounge features a curved and cantilevered stair made of dark-finished steel, glass and aluminum panels, and white stone treads. The stair rests on a wood plinth which serves double duty as casual seating. The space is topped by a custom-designed steel and glass chandelier featuring amber, smoky green, and blue-toned hand-blown glass shades. 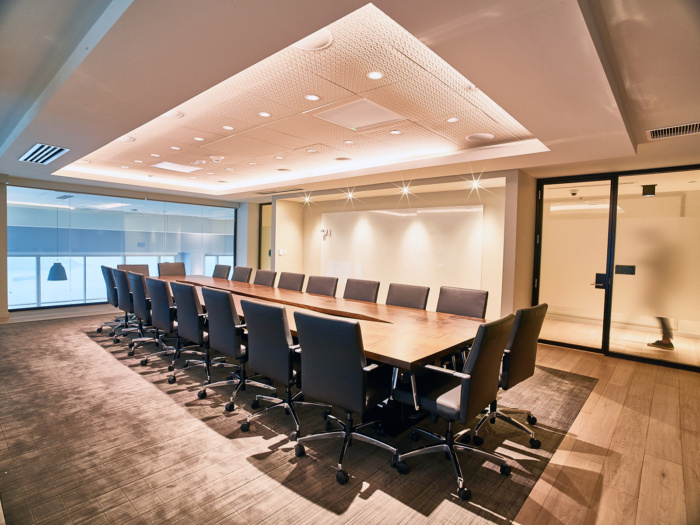 The mezzanine-style second floor holds several board rooms, one with a Juliette balcony overlooking the communal break room, as well as a suite of private, client meeting rooms. The large break room is a double-height space—sixteen-foot-tall— and is marked with a subtly toned mural stretching from wall to ceiling. The mural was hand-painted on-site by a local artist on staff with the architects. The break room is separated into two areas, one composed of loose seating arrangements, and the other defined by a large, eighteen-by-fifteen-foot island and the adjoining kitchen. A hidden bar, styled as a prohibition-era speakeasy, is situated behind a door that blends with the café casework. The tiny space features vintage lighting, bar stools, and a tin ceiling. Flexible furniture arrangement, and folding, accordion-style doors connect the break room to the reception area, transform the area to accommodate large events and all-staff meetings.